Convenient and informative charger for photo batteries, which replaced the usual bundled no-display one for me. 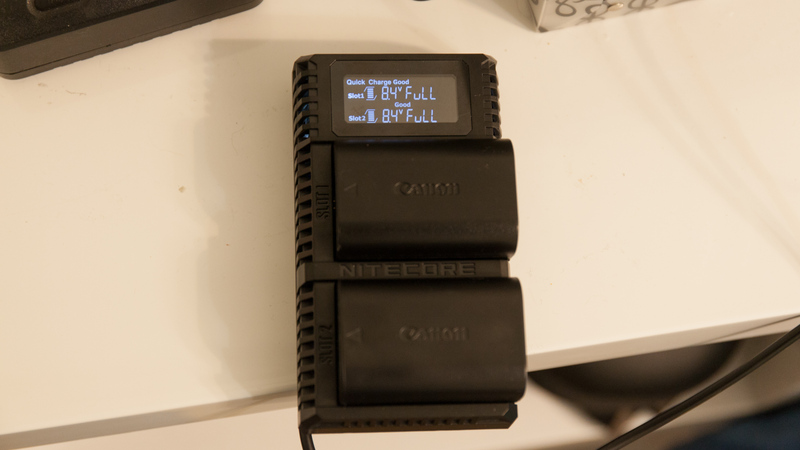 When I got my 5d Mark II delivered from Ebay, I got the usual unremarkable battery charger included. Ordinary and wellknown one to anyone who uses Canon stuff. 1 slot, red-green indication and, in my case, the Chinese plug which does not add any comfort. In terms of the main – charging process, I did not have any complaints. But here, for example, it was not possible to find out the difference between included battery and the ones I got from aliexpress. And I wanted to know it. The package is presentable. Black, thin plastic with a good design. 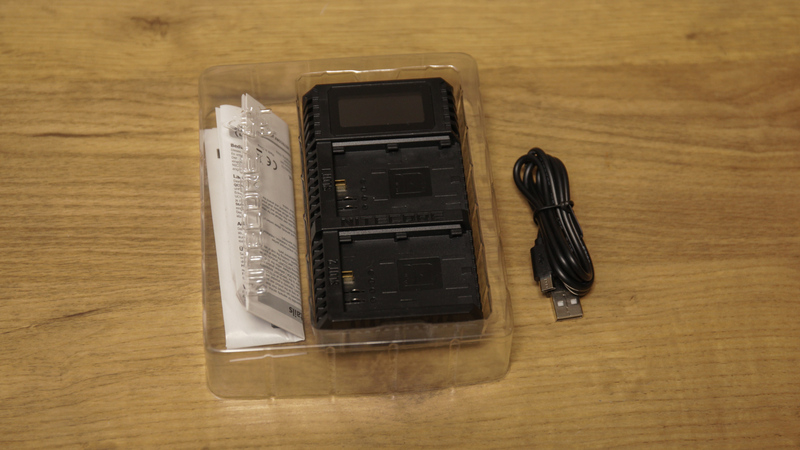 Inside, expected set of charger itself, micro-cable and instructions with the warranty. 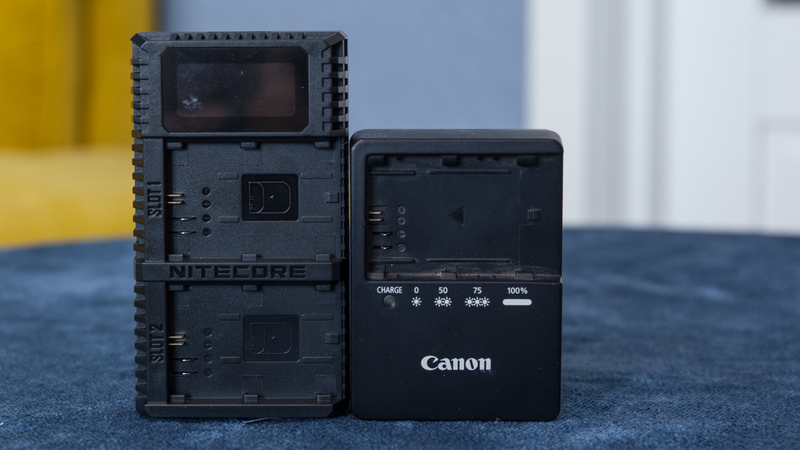 The charger itself is really compact, only 12×70×29 and 93g of weight. Here, for comparison, next to it – the usual charger. Build quality assembly is good – no backlash, no creaks. There are no gaps or plastic defects. In general, no trace of cheapness and amateurism. 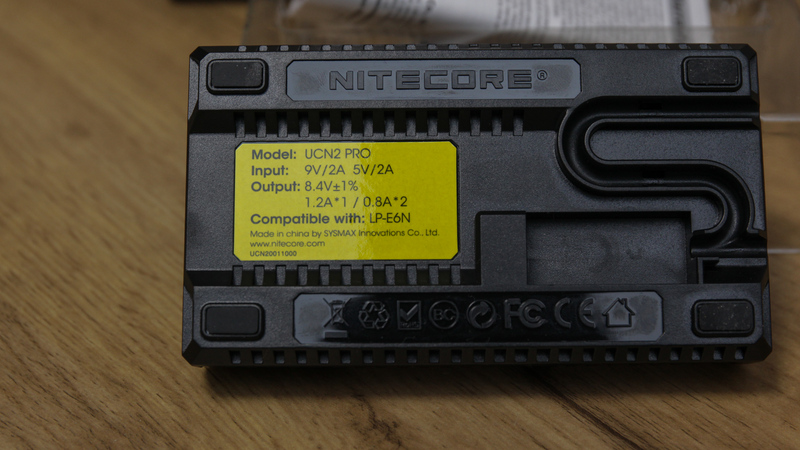 The regular charger must be plugged into 220v (or 110 in US) , then Nitecore UCN2 Pro can be hooked to anything that can charge via USB. 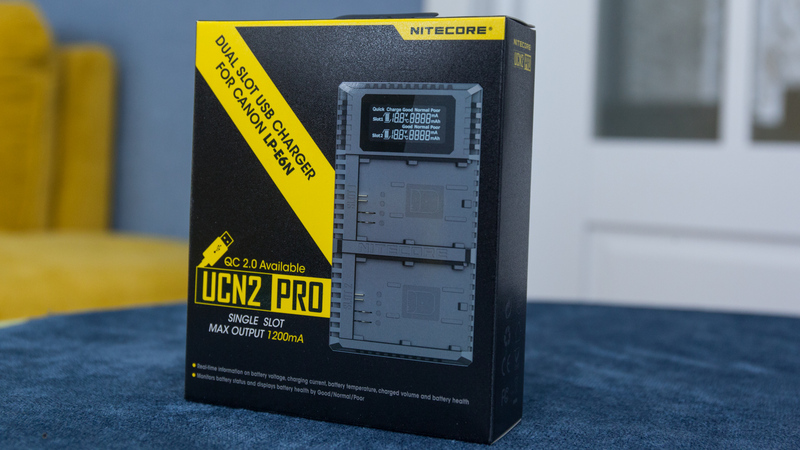 Here, of course, you need to understand that it is one thing to connect to something with a QC output, another thing to a 0.5A low current – the difference in charging time will be significant. The cable entry is located at the bottom of the charge. If the cable is not fixed in a special curved groove, then it will not hold securely. And here the situation is twofold. If you want the cable to be fixed and under no circumstances (and there may be need to charge on the go, from power bank) interrupt the charging process, then you place cable it in a curved groove. I do not think that this will have a positive effect on the longevity of the cable if you bend it every time. Nevertheless, for the sake of justice, the cable costs a penny, and everyone now probably has at least 5-7 pieces of their house somewhere spare. That is mostly about “in the field” use, when and where that cable may be needed to charge a smartphone \ tablet. While at home or in office you can simply put the cable once and just keep it wrapped around the charging when you don’t keep it plugged. Actually, that is a minor detail that I mention here in order not to miss anything in the review. And in real life you`ll not care about it, I suppose. Here is a photo of all of the front side. At the same time right there on the bottom is a label with specs of charger. There are no more decorations worth mentioning, except that the model name located above the display. Yes, there are still visible small legs with rubber pads, so charger will not slip. Charging is not collapsible, so there will be no pics of insides , everything is soldered here. On the other hand, once I add V\A charts here in review, I do not think that the giblets are so important here. 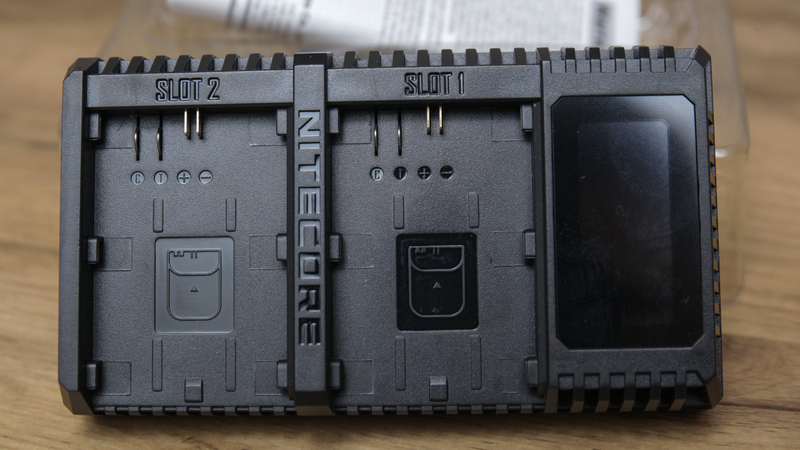 So, the front side consists of 2 battery compartments and a display at the top. 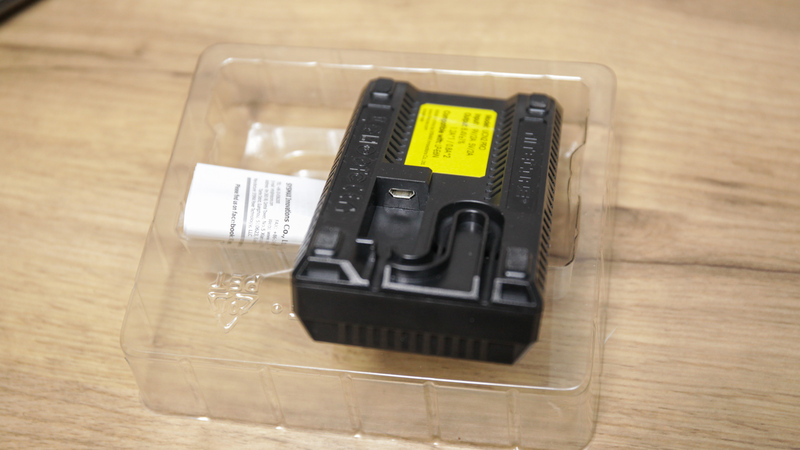 Batteries are securely fixed, there is no backlash. 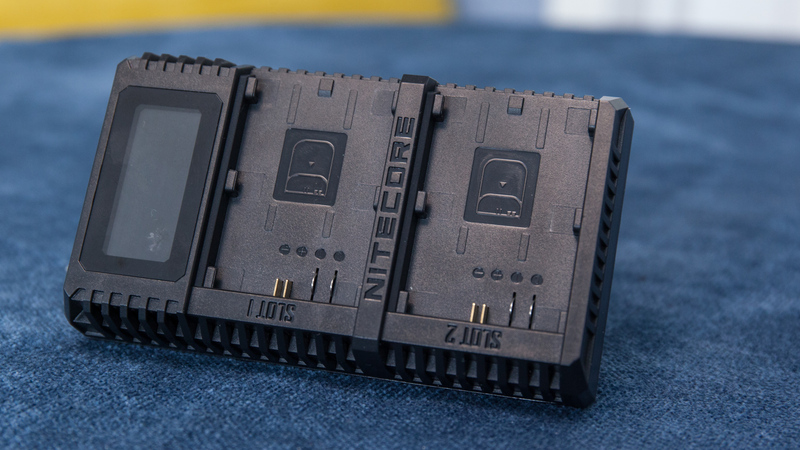 The display is as informative as possible and shows absolutely everything you need. Even displayed temperature is not so important, but, nevertheless, it also shows it. Actually, at the top of the review there is a vivid promotional picture where you can see everything that is shown on the display. 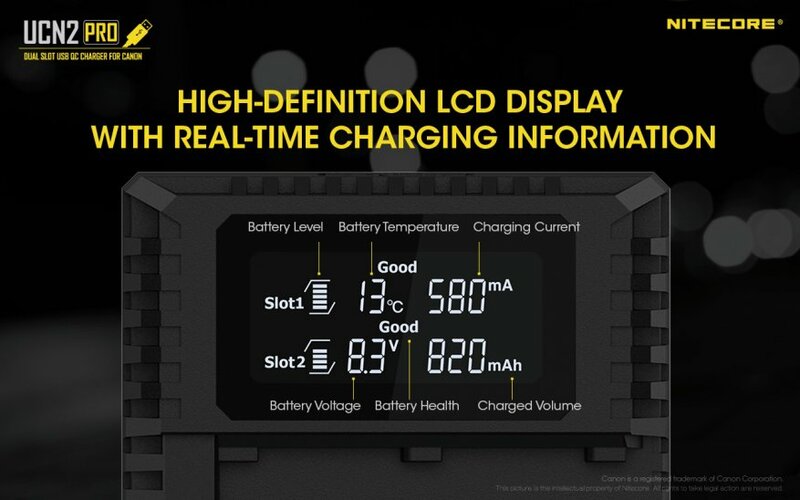 Once again, these are voltage, current and charging time, “charging complete” and “bad / good battery” statuses, mah number, temperature, slot number and the simplest segment charging indicator. Here I, perhaps, preferred to see the percentage instead of the last one, but seeing the voltage, you can estimate how much is left there to complete charge. As I mentioned at the beginning of the review, I have a couple of betteries from ali and there were doubts about their authenticity. 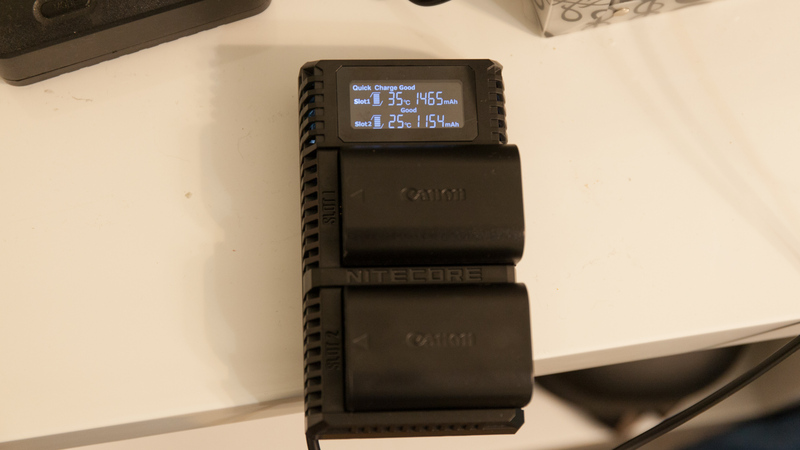 But the very first discharge-charge showed that I got decent capacity batteries. Great. As for the charging process itself. See explanation from manual. Here, by the way, it is clear that there is a loss on the conversion. 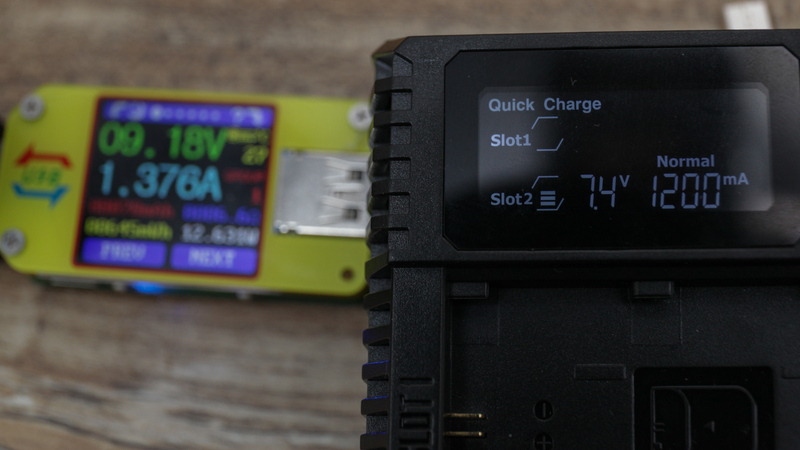 The tester goes 9.18v \ 1.37A, on the display of charger you see 7.4v \ 1.2A are visible. However, this is expected and absolutely umimportant. So, when you see charts beloew, also consider this. 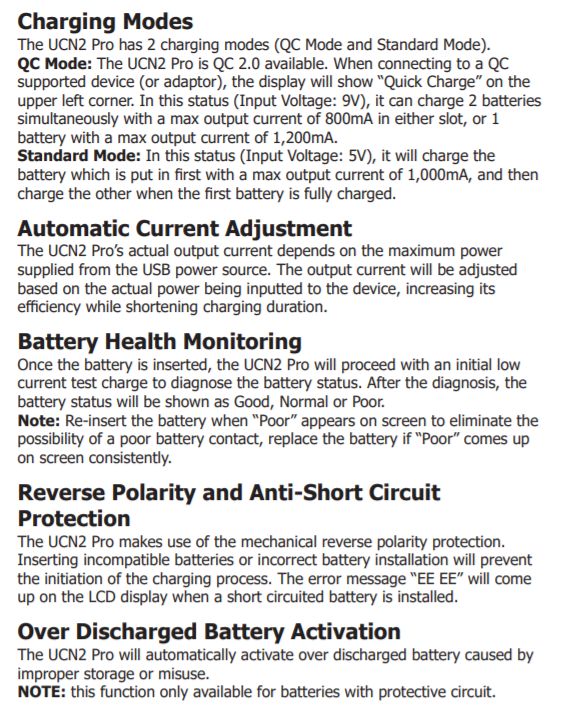 Well, here’s the most interesting thing – the charging schedule with one and two batteries. Well buit, convenient and informative charger. 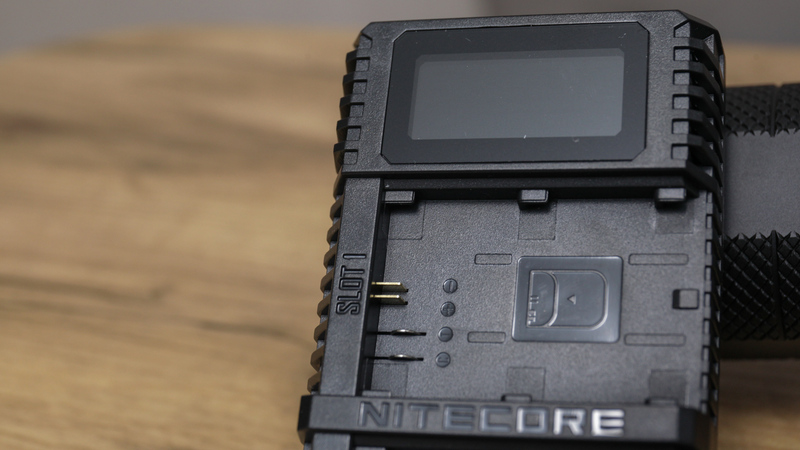 If you need to be fully aware of the state of your batteries – Nitecore UCN2 pro (UCN1 – as an option for one battery) will show itself from the best side. There is no need for a power outlet, you can charge anywhere and from anything with a USB-out. The charging current is good. The display is as informative as possible. 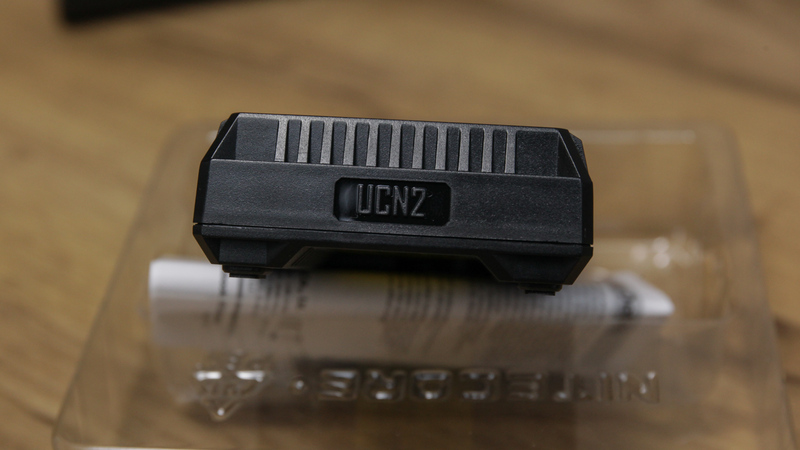 For ease of use there are no complaints, as well as the build quality and appearance. Honestly recommend this one. 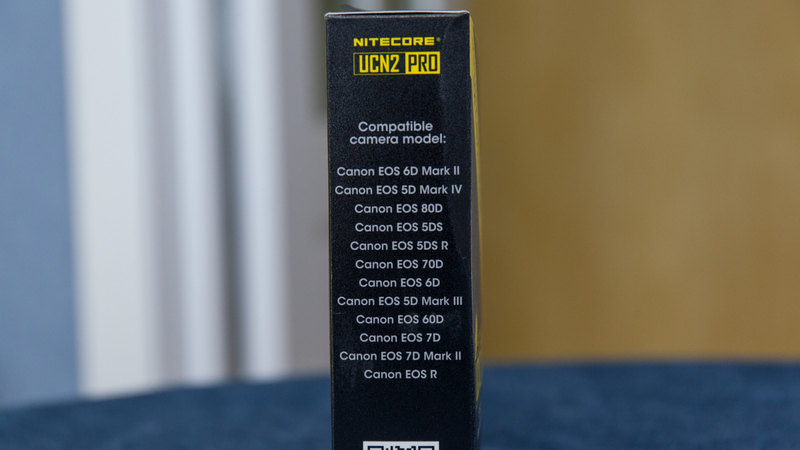 And as there are the same model for another camera brands like Nikon etc, you can count that this review will also be valid for them.